1. Add the olive oil and garlic to the asparagus and toss to coat. 2. Cook the asparagus in a hot griddle pan or over a charcoal barbecue for 4-6 minutes, turning frequently, until tender and slightly charred. 3. Meanwhile, crumble the feta into a bowl and mix with the cumin seeds, chopped mint, lemon zest and juice. 4. 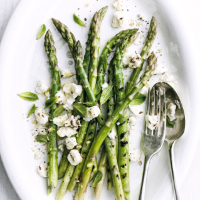 Divide the asparagus among plates and scatter over the feta mixture. Grind over plenty of black pepper and serve.